Standard Intake Door is 18"x18" Side Hinged. Also available left, right or bottom hinge. Specifications: Doors are fabricated with type 304 Stainless Steel, Stainless Steel Hinges, with a self closing, self latching quite door closing function. Classified UL' Class B labeled: 1-1/2 hour fire rated with 30-minute temperature rise of 250 degrees Fahrenheit and a frame suitable for enclosing multiple type chase construction. Doors are provided with key locking devices at each intake door location. Door trim is embossed LINEN'. A leader in the Trash Chute and Linen Chute industry. We are a full service company designing and manufacturing our products onsite in the USA. 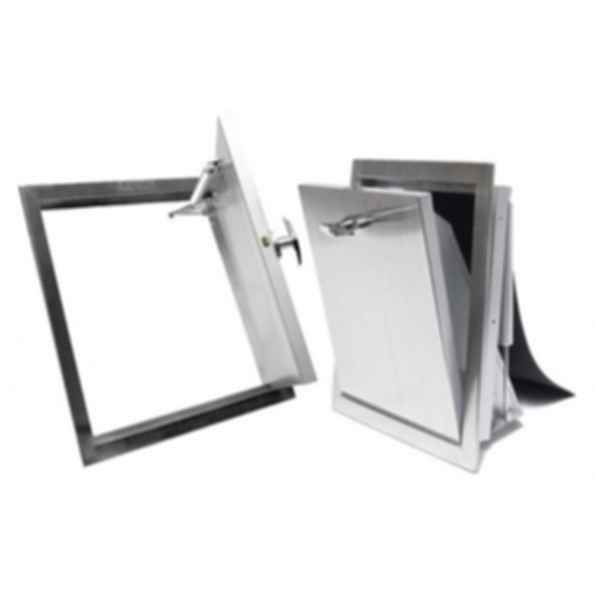 We offer a variety of products including Trash Compactors, Trash Chute Doors, Linen Chute Doors, accessories, hardware, and components. All items are available in standard and custom specifications. We welcome you to explore our site and contact us any time to start your project, place your order, or request additional information.